Hermansson Hiller Lundberg – a Stockholm studio made up of architects Andreas Hermansson, Andreas Hiller and Samuel Lundberg – designed the building as a permanent residence for a family. 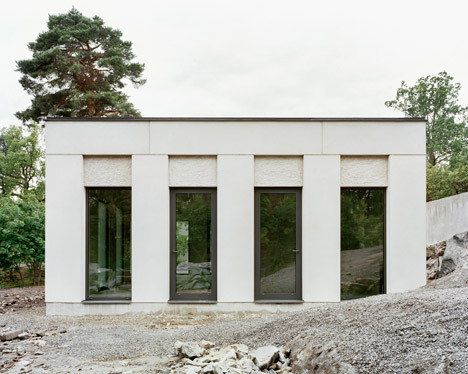 Broad white piers and a colonnade suggest a Classical aesthetic on the facade of this small residence near Stockholm by architecture firm Hermansson Hiller Lundberg (+ slideshow). “The repetition of pillars and the juxtaposition of building elements create a minimalistic complexity,” said Hermansson Hiller Lundberg. These were rendered off-white, with the most prominent surfaces given a smooth surface, while others were left with a rough texture. Walls and ceiling surfaces inside the house have also been rendered off-white, while the floor is polished concrete.